So, you have a full-suspension mountain bike. That’s awesome! When you ride a full-suspension bike instead of a hardtail mountain bike, you can generally roll over technical terrain with less effort and you will have more traction over rough or loose surfaces... if your suspension is set up properly. Improper suspension setup is one of the main reasons riders experience a poor ride on their mountain bike. Travel: The amount “squish” your suspension has, or in other words the length of the stroke of your suspension. For example, the Liv Hail has 160 mm of travel and the Pique has 120 mm of travel. Fork: The front suspension on a mountain bike. Shock: The rear suspension on a mountain bike. Stanchion: The shiny part of the fork or shock that goes into the “lowers” on the fork and the body of the shock. Sag: The amount of travel which is used just by sitting on the bike. Performing a sag test is how you measure if you have enough air in your fork or shock. Ideally, you want to sit into the travel about 25-35% of the total travel. Shock Pump: The device you use to pump air into your shock and fork. Your regular bike tire pump won’t work! Compression Damping: Some forks and shocks have a knob that allows you to control the flow of oil through small holes in the internals of your suspension. The more compression damping you use, the firmer the shock or fork will feel. Rebound Damping: The rebound adjustment knob controls the speed at which your fork or shock returns to natural position. The more rebound damping you use, the slower the fork or shock will return to its natural position. Grab a friend! It is much easier to check your sag when you have a buddy to hold your front wheel. If you have compression damping knobs, make sure they are in the fully “open” position. Stand up on the pedals and bounce a few times. This will get the oil moving through your suspension and ensure your fork or shock isn’t “stuck” in place. When bouncing, make sure you put a little pressure on the front of the bike, as if you were actually riding. Standing in your “neutral” position on the bike, have your friend reset the rubber o-rings on your stanchion. Gently sit on the saddle and dismount your bike. Look at your stanchion. You can use a ruler, but generally you can tell just by eye-balling it. If your o-ring is about a quarter of the way down the stanchion, your suspension is set up correctly. If the o-ring is less than a quarter of the way down, you have TOO MUCH air in your shock or fork; use the shock pump to remove air. 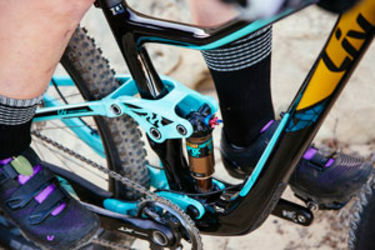 If the o-ring is more than a quarter of the way down your stanchion, you have TOO LITTLE air in your shock or fork; use the shock pump to add air. Rebound should always be adjusted after you have checked for correct sag. When adjusting the rebound, keep in mind it is a personal choice but if your rebound is too fast or too slow, it could be very bad for your riding. As a general rule of thumb, start by finding out how many “clicks” of rebound you have to work with. Turn the rebound knob all the way to the left (toward the jackalope on RockShox or toward the minus sign on Fox) to remove all the damping. Then, count the clicks as you turn the knob to the right (toward the turtle on RockShox or the plus sign on Fox). Once you have your number, click back the other direction half way. The best way to dial in your rebound is to really pay attention to it on a ride. If you feel like your bike is trying to eject you when you land a jump or drop or your ride feels really rough over technical terrain, you might want to slow down your rebound/ add more rebound damping. If you feel like your suspension is “packing up”/ not returning to its natural position when riding over several bumps in quick succession, then you will want to speed up your rebound/ remove rebound damping. All forks and shocks are different. Some have high and low speed compression damping, some have two settings, some have three and others have none! So, get to know your suspension and review the manufacturer’s diagrams and suggestions on their website or in the pamphlet that came with your bike! We will give you this bit of advice: If your fork or shock has a “lock out” compression damping position, only use this setting when riding on road, gravel, or smooth single track. If your sag is set correctly, you will want your suspension active when climbing technical single track. Just as you want your suspension as active as possible when descending over rocks and roots, when climbing over the same features having suspension will help your tires stay on the ground and, therefore, increase your traction! Is your head spinning yet? Suspension is pretty technical stuff, and we just grazed the surface! Bottom line, play around with the knobs on your fork and shock. Figure out what all the settings do and find out what feels the best to you!